He pulls to a stop outside the Old Convent in Ballyhaunis, Co Mayo. Perched on a hill, surrounded by high walls and a remote-controlled gate, this cold, imposing building has always stood aloof from the life of the town below.The nuns who lived here when I was a boy have left, and the institution has been repurposed as a direct provision centre for asylum seekers. Across the State, some 5,000 people live in more than 30 of these centres. Asylum seekers are not allowed to work or to receive social welfare. Instead they are given full-board accommodation and allowances of €19.10 per adult and €9.60 per child per week. The nuns had their vows and the piety. The roughly 250 (mostly African) residents packed in to the Ballyhaunis centre today are separated from the local community by even wider chasms of language, culture and circumstance. Ballyhaunis is Ireland’s most ethnically diverse town. The foreign-national population here was 42 per cent at the 2011 census. A majority of children in the local primary school, Scoil Íosa, do not speak English at home. And the refugees housed in the Old Convent are only a small part of that ethnic mix. The town is home to a well-established community of Pakistanis and Syrians, who came here in the late 1970s and built Ireland’s first purpose-built mosque on Clare Street not long afterward. A sizeable contingent of eastern Europeans also arrived during the economic boom of the mid-2000s, as well as a large number of Traveller families. In a town where almost as many shop fronts are boarded up as are open for business, these communities have so far lived in peaceful, but parallel, coexistence. “We don’t know each other really,” says Gerard McGarry, president of the local GAA club. The club hosted an integration day at the local pitch at the end of May. Ballyhaunis is a vibrant club, winning senior hurling and intermediate football county champions in 2014. And based on the number of volunteers mobilised today, backing for the initiative is widespread. A garda by profession, Conlon is aware of the potential pitfalls ahead for a town like Ballyhaunis. The response from children so far is enthusiastic. Indeed, so many young sport enthusiasts are lined up outside the Old Convent when the bus arrives, it takes Carroll three runs to ferry them all to the pitch. One young Nigerian girl, an Irish dancer, is so excited she’s 1-2-3-ing nervously on the spot. Carroll greets several of the children by name. He’s been driving the bus from the Old Convent to Carrick National School, a few miles out the road, for more than a decade now. Despite their carefree smiles today, he says, many of them have witnessed terrible things in their lives. At the GAA pitch, the scent of barbecue is wafting in the air when we arrive. The convent children are handed paper tickets, entitling them to sweets, fizzy drinks and burgers. They exit the bus in record time. In the pitch area outside, a face-painting tent, a DJ, a male voice choir, Irish dancers and a marching band vie for their attention. Under-six and under-eight football and hurling matches are already under way on the playing field. Girls and boys of different races throw themselves into the fray. Watching from the sidelines is Faith Kayange, from Malawi. Her six-year-old son, Mike, has been a member of the club for more than a year. Kayange says the first time she saw small children carrying sticks and wearing helmets, she was a little alarmed. “Hurling is a bit scary to me,” she says, laughing. But Mike has grown to love Gaelic football and his mother is appreciative of the encouragement he has received. That isn’t exactly an idle thought. On the pitch, Darran Conlon is keeping a close eye on his new recruits. He is outspoken in his criticism of the direct-provision regime, in which refugees are prohibited from working for years on end while their asylum applications are processed. He believes direct-provision centres are “the Magdalene Laundries of our time”. Yet he freely admits the club’s interest in refugee children is not entirely altruistic. “They’re natural athletes,” he says. “One boy from the convent picked up a ball and started toe-tapping like the Gooch. I said, ‘Where’d you learn to do that?’ ” The boy shrugged. Africans are relatively new arrivals on the Ballyhaunis GAA scene. But the club has scarcely fielded an underage team in the past 15 years that didn’t include at least a couple of players of Muslim origin. Nearby, Hannan Iqbal pucks a sliotar among group of novice players. The 21-year-old is the walking embodiment of the social and sporting dividends the club’s integration policies are paying. When Iqbal took up hurling, aged 11, he wasn’t yet fluent in English. Today his accent is indistinguishable from those of his Irish-born teammates. Did he ever experience racism on the field, I ask? Not in hurling, he says. 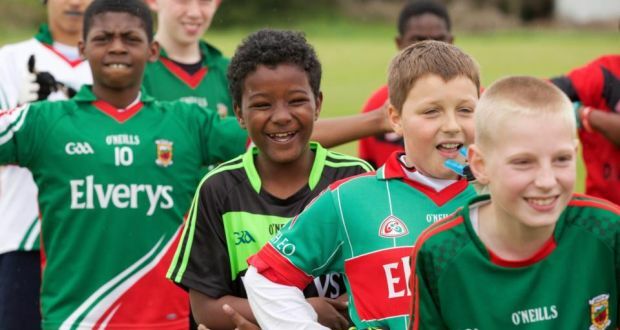 The Mayo hurling fraternity is small. Having represented the county from under-14 level upwards, his opponents have tended also to be his friends. So there have never been any real problems. Iqbal is studying biochemistry at NUI Galway, where he is secretary of the university’s GAA club. He also does PR work for the GAA’s Connacht Centre of Excellence at Knock, Co Mayo. He’s so devoted to hurling, he spurned the opportunity to study abroad on Erasmus because he couldn’t bear to be away from the game. For Dr Orla McGarry, a migration sociologist at NUI Galway, it was her own experience studying on Erasmus in France that first inspired here to undertake a serious sociological examination of conditions for migrants living in Ballyhaunis. “When it comes to asylum seekers, socialising is more of an economic problem,” says McGarry. “They haven’t the money to go out even if they wanted to. So what’s important here is to seek out things each community has in common, common thresholds at which we can meet halfway. Of course, not every child is going to be interested in playing sport. And among the Muslim community, at least, female participation in Gaelic games appears to be taboo. McGarry acknowledges these points. She mentions Hijabs and Hattricks, an initiative launched by a Dublin soccer club to show that Muslim women can play football without compromising their female modesty. On the pitch outside, the children are wrapping up festivities for the day by marching, in their club and county colours, under the national flags of Pakistan, Palestine, Mali, Liberia, Ghana, Angola, Kosovo, Ireland and a half a dozen other countries whose colours I fail to recognise. The rain is bucketing down. But the kids stand tall. It’s a moving spectacle. In the viewing stand, a trio of local TDs, John O’Mahony, Michelle Mulherin and Dara Calleary, are all effusive in their praise for today’s event. Ballyhaunis GAA president Gerard McGarry even suggests the town’s multicultural experience might help guide policy at a national level. Problems still exist in Ballyhaunis, and the fault lines aren’t always where you’d expect. Dr Orla McGarry’s research uncovered latent tensions in the secondary education system between Punjabi-speaking Muslims in the established community and the mostly Urdu-speaking Muslims living in direct provision. But community relations anywhere are always going to be a work in progress. Ballyhaunis, at least, appears to have set its course in the right direction. A couple of hours after the crowds disperse here, organiser Darran Conlon tweets a photo of local black, white and Asian children holding up a large “Give Respect, Get Respect” banner.